The DoD Bloggers Roundtable met with Col. Jennifer Menetrez, the Joint Task Force-Haiti Surgeon. Col. Menetrez discussed the JTF-H medical operations and the increasing medical capacity of the Haitian government and Non Governmental Organizations (NGO)s in Haiti. In fact, while the earthquake was certainly a tragedy it might be a new beginning for Haiti! She commented specifically on the resilency of the Haitian people and the outpouring of international support as keys to the efforts to save lives and help rebuild the medical care programs. The economy is starting to return and the the outcome may “produce highter standards” and certainly the cooperation between the government of Haiti, the NGOs, the US military and other government organizations has been exceptional. 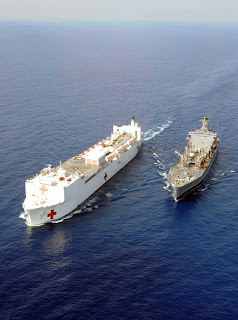 She had high praise for the efforts of the US military personnel and non governmental organizations such as the Red Cross but felt that the USNS Comfort, hospital ship, “...was a symbol of what we are doing” for the Haitian people. The surgeon said that the Hait ian Minister of Health will be visiting today to meet and thank the crew of the Comfort which has conducted almost 1,000 surgeries, 7,200 out patient care sessions and provided 1,300 post operative care appointments with Haitians. The Comfort has had a steady decline of patients which she felt was a reflection of the new capabilities of the Haitians and NGO support on the island. The high point of the Comfort was on January 29th when they conducted 50 surgeries in one day and had 485 patients. As of today, the Comfort has no Haitian patients and she said the Comfort will be there until the Haitian government and US officials determine that she is no longer needed and will resume her other missions. The medical teams from the different organizations have begun 130 mobile and 156 first aid clinics through out the country to reach the entire population in need. When specifically queried about an outbreak of malaria within US military forces she said there had been six cases and that the individuals involved may have not followed the proper protocols as provided by the military leadership and since the protocols had been re-emphasized there had no further cases. The Haiti earthquake has certainly been a very difficult time for her people and institutions but hopefully as Col Menetrez said it may be a new beginning for her as well! We are very proud of the response of our country including our on the scene military personnel from the very beginning. When the Coast Guard arrived on January 13th within 12 hours of the earthquake began a memorable effort to save lives! 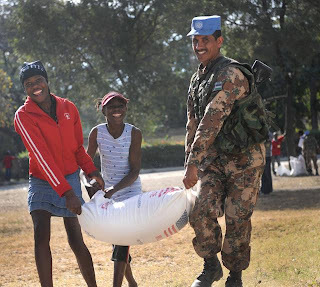 Success is measured in the smiles of Haitian men, women, boys and girls! To listen to the Roundtable or read a transcript please go to DoDLive! Again, a big thank you to Col Menetrez for her time and the Roundtable emcee Lt Jennifer Cragg!